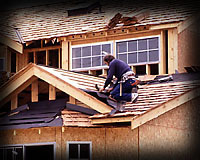 Beyer Roofing Company can handle the special and the unique. Some special use buildings such as churches and many older residences have very complex roof systems. They will often have very steep pitch, numerous peaks and valleys, and will have details that fit the time era in which they were constructed. Beyer prides itself on being able to help these buildings retain their original look and feel while providing a better roof system that will help them remain in use for another generation! Steep-pitched spires and main roof were the one of the special problems when dealing with this roofing contract. Beyer Roofing also had to match current shingle materials with the look and feel of the architecture of of this early 20th century church located in Bay City, Michigan. Sts. 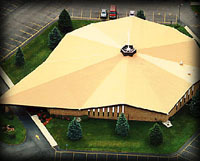 Peter and Paul Catholic Church in Saginaw Township has a very unusual roof! That didn't stop Beyer Roofing from tackling the project ­ and successfully completing a quality job! Beyer Roofing Company loves to take on roofing projects that require a higher level of expertise such as large, complex new construction or remodeling as well as residences and buildings of historical value. 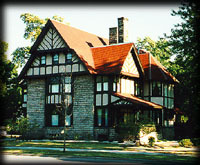 Matching materials and installation methods so that they fit with the architectural style of the building but give the structure a sound, quality roof, is the goal of Beyer Roofing when they work on such projects like the older, historical private residence (picture on right) located on Center Avenue in Bay City, Michigan.